The writing sample is not scored. No one from the LSAC will read your essay. The LSAC simply scans what you’ve written and sends a copy of it to each law school that you apply to. The law schools are free to do with it whatever they see fit. The fact that the writing sample is not scored has two implications for you. First, studying for the writing sample will not help you get the highest score you can on the LSAT. Thus, you don’t need to read this chapter any sooner than one or two weeks before you take the test. As test day draws near, read through this chapter and then work two or three practice writing samples so that you get a feel for what they look like and some experience applying the techniques in this chapter. That’s all you need to do. The overwhelming majority of your preparation time should be spent on the other three sections. Second, to succeed on this section, all you have to do is write a decent essay. It doesn’t have to be perfect or even great. If an admissions officer is on the fence about your application, or if you are at the top of a short list, he or she might read your essay looking for red flags—your grammar, syntax, or spelling are atrocious, your essay is poorly organized, you didn’t follow the instructions of the section (these are all warning signs that you’re likely to struggle academically), or you have a bad attitude. As long as you write a competent essay that doesn’t trigger any alarm bells, you’ve done your job. And you won’t reap any additional rewards by going above and beyond that modest target. With those two caveats in mind, the two cases in this chapter will teach you how to approach the writing sample. Case 1 introduces the five-paragraph structure you should use to write your essay. Every writing sample prompt follows the same basic format. As a result, no matter what the specific content of your prompt is, you’ll be able to write an effective response to it using the five-paragraph structure. Case 1 also discusses the importance of prewriting and lays out a systematic process you can use to plan and organize the content of your essay. Case 2 discusses eight general principles of good writing that are particularly pertinent to the writing sample. Learning and adhering to these principles will help you produce a polished, reader-friendly essay. This case introduces the five-paragraph structure you should use to write your writing sample. It also introduces a two-stage prewriting process that you should use to plan and organize your five-paragraph essay. The prewriting process and five-paragraph essay structure you’ll learn in this case will help ensure that your writing sample demonstrates clarity and good organization—two qualities that are very important to the law school admissions officers who might read your essay. Admittedly, the five-paragraph structure is a little bit mechanical and formulaic. But remember, your goal is to write an essay that is free of red flags. If you follow the advice in this case, you can rest assured that your writing sample will be good enough to keep you in the running for admission to any law school you apply to. The writing sample is an exercise in priority setting and comparative decision making. The prompt will present you with two options and ask you to select whichever one of them better accomplishes two stated goals (we’ll call them goal A and goal B). You’ll then be presented with a set of facts that explain how well each option accomplishes each goal. Generally speaking, the facts will demonstrate that one option will successfully accomplish goal A but fail to accomplish goal B, and vice versa. Unlike the material in the other sections, which is dense and academic, the writing sample prompts are simple and straightforward. They involve regular people making everyday decisions: parents deciding where to send their child to preschool, a small business deciding how to expand, a vacationer deciding how to plan a trip, and so forth. Your task is to write a persuasive essay that argues in favor of one option over the other option. There is no right answer. One option is not inherently superior to the other. In fact, the prompts are designed so that either option is a defensible choice. The quality of your answer depends not on which option you select, but rather on how well you defend the option you’ve selected and criticize the option you’ve rejected— essential skills that all future lawyers need. Paragraph 2: Discuss the goal that your option satisfies. Paragraph 3: Discuss the goal that your option does not satisfy. Paragraph 4: Explain why the goal that your option satisfies is the more important of the two. This five-paragraph structure reflects the distinctive style of writing that is favored by the legal profession. Legal writing is relentlessly functional. Lawyers expect any piece of writing they read—be it a brief, a memo, or a letter—to (1) tell them what it’s going to say; (2) say it; and (3) tell them what it just said. It might feel repetitive at first, but using it will make your writing focused, easy to follow, and persuasive. This is what good writing looks like to a lawyer. This is the style of writing that law school admissions officers and the professors on law school admissions committees are accustomed to seeing. Therefore, it’s the style of writing you should adopt in your writing sample. The five-paragraph structure embodies this style. Think before you write. It’s impossible to write a clear and organized essay unless you begin writing with an idea of what you want to say and how you want to say it. That requires upfront planning. You’re given 35 minutes to work on the writing sample. You should spend roughly the first 10 minutes of your time doing prewriting. About two-thirds of the page on which the writing sample prompt appears will be blank and designated as scratch paper. Use that space to plan your essay. Ron wants an apartment that is a short, convenient drive to his job. Ron wants an apartment in a neighborhood where he can maximize the amount of leisure time he spends outdoors. The high-rise apartment is located close to a highway on which Ron can drive to his job. With no traffic, the drive takes 10 minutes, but the highway suffers from heavy traffic congestion an average of two days a week. There is an entrance to a bike trail five blocks from the high-rise building. Ron does not own a bicycle. The high-rise building is less than a block away from a public pool, which is open from May through September. The neighborhood is home to many cafés, bars, and coffee shops, most of which have outdoor patios. The apartment in the gated community is located along a major thoroughfare that runs directly to Ron’s job. With no traffic, the drive takes 20 minutes, but there is moderate traffic congestion along the route every day of the week. An outdoor walking/jogging trail runs around the perimeter of the property on which the gated community is located. The city’s largest park is two blocks from the apartment. There is a farmer’s market in the parking lot of a nearby shopping mall that is open for business once a week. Finally, determine whether each fact is positive or negative when viewed in light of the goal that it’s relevant to. Make a note of your determination by drawing a plus sign or a minus sign in the margin next to each item on your lists. This should help you start to get a sense of which option you think is stronger. Once you’ve made these notations, you’ve completed the organizing stage of your prewriting process. You should be able to complete this stage in less than five minutes. Next up is the brainstorming stage. Start out by figuring out how the two options relate to each other. As noted above, it’s typically the case that one option does a better job of accomplishing goal A, and the other option does a better job of accomplishing goal B. In our sample prompt, the high-rise apartment probably does a better job of being convenient to work; the commute time is half as long, and on most days there is no traffic. 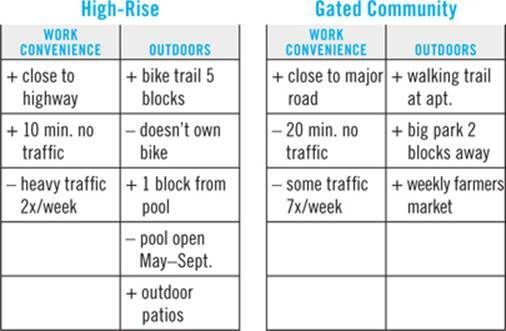 But the gated-community apartment has more options for outdoor activities. Once you know which goal each option accomplishes, your task is to decide which option you’re going to advocate in your essay. The fourth paragraph in your five-paragraph essay will be dedicated to explaining why one goal is more important than the other. It’s a sensible, straightforward way to break the tie between the two options. As you’re brainstorming, come up with two or three reasons why one goal is more important than the other goal. It doesn’t matter which goal you pick; all that matters is that you come up with compelling arguments defending your choice. And you’re not limited by the content of the prompt. You can be creative in coming up with reasons to prioritize one goal over the other. Continuing with the sample prompt, you might argue that convenience to work is more important because a longer commute would cut into the time that Ron could spend outdoors or because he can only spend time outdoors during certain times of the year. Conversely, you might argue that it’s more important that he have lots of options for being outdoors because being outside is what makes him the happiest or because he won’t mind the longer commute if he’s able to regularly exercise outdoors. You’re free to make whatever arguments you want as long as they are sensible and plausible. Once you’ve decided which option you’re going to defend, you’ll turn to thinking of ways to play up its strengths and downplay its weaknesses. Review the list you made of the facts that are relevant to your chosen option’s ability to satisfy each of the goals. Try to think of reasons why any positive fact is especially important and why any negative fact is insignificant or unimportant. When you’re done, repeat the process with the other option, only this time try to amplify the importance of the negative facts and minimize the importance of the positive facts. The ideas you come up with here will be incorporated into the second and third paragraphs of your essay. Once you’ve completed this process, you’re ready to begin writing. Paragraph 2: Discuss the goal your option satisfies. Paragraph 3: Discuss the goal your option does not satisfy. As you begin writing, be cognizant of the fact that you have a limited amount of space to write in. There are 55 lines on the two pages that make up the writing area. Most people write between 8 and 10 words per line. That gives you about 450 to 550 words to work with. You can’t afford to be verbose. You need to write five full paragraphs, so budget your space accordingly. The introduction and the conclusion should be a little bit shorter: 3 to 4 sentences each for a total of about 8 lines. The three body paragraphs should be a little longer: 4 to 5 sentences each for a total of about 13 lines. It’s especially important to pay attention to the space constraints in the early stages of your essay. You’ll dig yourself a hole that’s very difficult to climb out of if your first paragraph is 20 lines long. Your introductory paragraph should tell the reader everything you’re about to say. The first sentence of the introductory paragraph should state your ultimate conclusion. Don’t begin with a restatement of the problem or issue; take a stance right out of the gate. The second sentence should state that your option accomplishes goal A, for example, while the other option does not. The third sentence should minimize both the extent to which your option does not accomplish goal B and also the extent to which the other option does. The final sentence should briefly explain why goal A is more important. If the reader were to stop reading after that first paragraph, he or she should have a handle on the core arguments of your essay. The second paragraph will focus on the goal that your option successfully accomplishes. You need to make two separate kinds of arguments here. First, you want to emphasize the strengths of your option vis-à-vis this goal. Second, you want to emphasize the weaknesses of the other option vis-à-vis this goal. As you do so, don’t merely recite the facts as they’re listed in the prompt. Interpret those facts. Explain why they are significant. Extrapolate from them to draw your own conclusions. Try to say something about all of the facts in the prompt. As you write, refer to the list of relevant facts that you made while you were organizing. Put a check mark next to each fact once you’ve said something about it. Talking about each of the facts will help your essay appear thorough and thoughtful. It will also ensure that you don’t run short of things to talk about. The third paragraph will focus on the goal that your option does not accomplish as effectively as the option that you’ve rejected. Your task here is the mirror image of what it was in the second paragraph. You want to minimize the weaknesses of your option as it relates to this goal, and you want to minimize the strengths of the other option. To be clear: do not minimize the importance of the other, less-important goal in the third paragraph. Save that for paragraph four. In paragraph three, focus on why your option might be better at accomplishing this goal than it first seems and why the other option is actually not as great as it’s made out to be. The purpose of the fourth paragraph is to explain why the goal that your option satisfies is the more important of the two goals. You should offer two or three reasons to support this determination. You might simply argue that goal A is more important than goal B, period. You might make an argument about comparative effectiveness, that is, that your option will do a better job of accomplishing goal A than the other option will do of accomplishing goal B. Or you might argue that accomplishing goal A in the short run will actually make it easier to accomplish goal B in the long run. There are other possibilities, too. You’re free to use any argument you can think of that provides a plausible reason for prioritizing the goals the way you did. The first two words of your final paragraph should be, “In conclusion.” Substantively, this paragraph will be very similar to your first paragraph. Remember, good legal writing tells a reader what it’s about to say, says it, and then tells the reader what it just said. The final paragraph will once again state which option you’re defending, emphasize how effectively that option accomplishes one goal, downplay the extent to which it fails to accomplish the other goal, and explain why the first goal is more important than the second. Don’t reproduce your introductory paragraph verbatim. Vary your word choice and your sentence structure. But content-wise, there should be nothing in the last paragraph that hasn’t appeared at an earlier point in the essay. Following are two sample responses to the example writing sample prompt about Ron Bryant’s new apartment that was introduced earlier in this case. The first essay selects the high-rise apartment option. The second essay selects the option of the apartment in a gated community. You can refer to these essays as you practice writing essays on different topics. As these sample essays illustrate, the option you choose to defend is less important than the manner in which you defend it. Ron should move into the high-rise apartment. The high-rise apartment is substantially more convenient to his job and will minimize his commute time. Although the apartment in the gated community would probably allow him to spend more time outdoors, there are several good outdoor-entertainment options near the high-rise. And it is more important that Ron’s apartment be in a convenient location, since a long commute would drastically reduce the amount of leisure time he has to spend outdoors. The high-rise apartment is substantially more convenient to Ron’s job than the apartment in the gated community. With no traffic, his commute will take half as long as it would from the other apartment. He’ll save that time twice a day: going to and coming from work. Assuming a five-day workweek, that means he saves more than an hour and a half of commute time per week. It is true that the highway that runs near the high-rise apartment has two days of heavy traffic each week. But even if the traffic were so bad that it doubled his commute time to 20 minutes, the high-rise is still more convenient. Every day there is moderate traffic congestion on the major thoroughfare outside the gated community, which would add a few minutes to Ron’s commute time. It is more convenient to have six 10-minute commutes plus four 20-minute commutes than it is to have ten commutes of 25 or 30 minutes. The high-rise apartment also would allow Ron to spend a lot of leisure time outdoors. While the public pool is only open five months a year, during those months it provides Ron with an outdoor-entertainment option that is unique among all the available alternatives. The neighborhood bars, cafés, and coffee shops would allow Ron to socialize outdoors with his friends. And the bike trail would allow Ron to broaden his horizons by taking up a new hobby. At the gated community, there is an outdoor jogging trail, but he can also walk or jog in the public park. And the farmer’s market is only available one day a week. There is no guarantee Ron’s schedule will allow him to regularly attend. Finding an apartment that is convenient to work is the more important of Ron’s two priorities. If he moved into the apartment at the gated community, Ron would spend at least an extra hour and a half—probably more—commuting each week. That time would directly trade off with time he might otherwise spend outdoors. Plus, he has some good outdoor-entertainment options at the high-rise, while there is nothing he can do to make the gated-community apartment more convenient to his job. The relative difference in convenience is much greater than the relative difference in his ability to spend time outdoors. In conclusion, the high-rise apartment is the better choice for Ron. He will spend substantially less time commuting to work if he moves into the high-rise, and he will have a solid range of outdoor entertainment options. In the end, it makes sense for him to make convenience to his job the higher of his two priorities. Ron should move into the apartment in the gated community. The gated-community apartment will allow Ron to spend substantially more leisure time outdoors. Although the high-rise apartment’s location is slightly more convenient, his commute time will be more consistent at the gated-community apartment. And it is more important for Ron to maximize the amount of leisure time he spends outdoors, since doing so will improve his outlook and demeanor. The apartment in the gated community gives Ron vastly superior outdoor-entertainment options. The convenience of the walking/jogging trail being located on the premises will allow Ron to make use of it every day. At the nearby park, Ron can have picnics or barbecues with his friends and attend community events. Shopping at the farmer’s market will allow him to spend less time indoors at a grocery store. At the high-rise, the bike trail is of no use to Ron without a bike, and the pool is of no use to him seven months a year. Patronizing commercial patios is expensive and does not allow Ron to exercise outdoors. Although Ron’s commute time might be longer from the gated community than from the high-rise, his schedule would be more regular and predictable. The level of traffic congestion on the road outside the apartment is the same every day. Ron could quickly figure out how much time the traffic would add to his commute and budget accordingly. By contrast, the level of congestion on the highway is unpredictable. Heavy congestion on a route that normally takes 10 minutes to travel at highway speeds could cause Ron’s commute time to be as high 30 minutes. But on any given day, Ron will not know in advance how long his commute will take. This unpredictability is a substantial inconvenience. It will make it difficult for him to ensure he arrives at work on time, and it will put a damper on his after-work social calendar. Finding an apartment that will allow him to maximize the amount of leisure time he spends outdoors is the more important of Ron’s two priorities. Being outside is Ron’s favorite pastime. A few extra minutes in the car each day will not feel like a steep price to pay for the ability to regularly socialize and exercise outdoors. Plus, the unpredictability of Ron’s commute to and from the high-rise would undermine his ability to spend time outdoors. For example, it would be more difficult for Ron to join an after-work softball league if he could not arrive to practice on time. By contrast, Ron’s regular, predictable commute to and from the gated-community apartment would not limit his outdoor-entertainment options. In conclusion, the apartment at the gated community is the better choice for Ron. He will be able to spend more leisure time outdoors doing a wider variety of activities, and his commute, even if slightly longer, will be more predictable. Given that spending leisure time outdoors is Ron’s favorite activity, it makes sense for him to make his ability to do so a higher priority than convenience to his job. This case discusses eight general principles of good writing that are particularly important to adhere to on the Writing Sample section. The Writing Sample section is designed to allow law schools to evaluate the organization, clarity, language usage, quality of reasoning, and mechanics of your writing. The arguments that you think up during your prewriting process will improve the quality of your reasoning. The five-paragraph structure will ensure that your essay is well organized. The principles discussed in this case focus on clarity, language usage, and mechanics. They also highlight some LSAT-specific strategies you can use to make sure that your essay does not raise any red flags when it’s reviewed by a law school admissions officer. The most surefire way to go astray on the writing sample is to fail to respond to the prompt. Obviously that means that you’ll get yourself in trouble if you write an answer that is frivolous or off-topic. But it also means that you put yourself at risk if you write a topical answer that, for whatever reason, makes it seem as though you weren’t giving your full effort. The easiest way to minimize this risk is to write an answer that fills up every line in your answer booklet. An admissions officer is much less likely to think that your answer is incomplete or half-hearted if you’ve used up all the space that you were given to write in. If an admissions officer is unable to read what you’ve written, that will count against you. If you know you have messy handwriting, make a conscious effort to slow down and write neatly. This is especially important if you’re a heavy computer user who’s out of practice when it comes to writing by hand. Also be sure to keep your writing within the designated area on the page (the boxed-in lines). The LSAC does not scan a copy of the margins, so anything that’s written there will not be transmitted to the law schools that receive your application. While it does not matter which option you choose, it matters a great deal that you clearly choose one of the options and stick to it throughout your essay. Because the quality of your reasoning is a critical component of your essay, you will hurt yourself if you flip-flop in your choice or use wishy-washy language to defend it. Since the prompts are carefully designed to allow you to write a good essay defending either option, it can be tempting to try to straddle the fence by saying something along the lines of, “Well, option 1 is really good, but option 2 has some good things going for it too.” If you write an essay like that, all you’re doing is demonstrating that you can’t follow directions. That’s not the message you want to send to the law schools you’re applying to. Resist the urge to hedge your bets. Pick one option and stick to it. Mechanics are the formal rules of writing. Make sure that your answer abides by those rules. For example, make sure your essay has multiple paragraphs. This is implicit in Case 1’s recommended five-paragraph structure, but it’s important enough to merit a separate mention. If there’s nothing on the page but a big, uninterrupted block of text, that will be a bright red flag to any reader. In addition, you should write in complete sentences. Avoid sentence fragments and run-on sentences. Use formal, proper punctuation. And follow the rules of capitalization. This last point can be tricky for people who have gotten into the habit of writing in all capital letters when they are printing by hand. Treat the writing sample like a term paper or a piece of business correspondence. Avoid slang, contractions, abbreviations, overly casual language, and jargon. If your parents wouldn’t be familiar with the word, don’t use it. You should also abide by the linguistic conventions of formal writing. Stick to the neutral, third-person point of view instead of using the first person (I, me, we) or the second person (you). Formal language is not the same thing as needlessly complex or pretentious language. Simple, straightforward language is the most effective way to communicate. Don’t use a big word just for the sake of using a big word. If a shorter word conveys your meaning just as well, use the shorter word. Simplicity is also a virtue when it comes to sentence structure. The best writing uses short sentences that are crisp and direct. Of course, you should vary your sentence structure and mix in the occasional compound, complex, or compound-complex sentence. But most of your sentences should be short, simple sentences. Strong topic sentences are the hallmark of good writing. Each of the five paragraphs in your essay should begin with a clear summary of that paragraph’s content. The topic sentence should serve the same function in relation to the individual paragraph that your introductory paragraph serves in relation to the essay as a whole: tell the reader what you’re about to say and why it’s important. You can’t write a strong topic sentence unless you have a clear understanding of what it is you’re trying to communicate in each paragraph. Therefore, you should start thinking about your topic sentences during the brainstorming stage of the prewriting process. A law school admissions officer who reads your essay will be paying close attention to your grammar, mechanics, and language usage. If you finish your essay with a few minutes left, go back over your essay and proofread it. Look for misspelled or repeated words, grammatical errors, missing punctuation, a lack of subject-verb agreement, and other mistakes that are easy to make when you’re writing under time pressure. This is not to say that you should hurry through your writing to make sure that you have time at the end to proofread. You’re better off taking the time to write clearly and persuasively. But if you do wind up with some extra time, use it to clean up any mistakes in what you’ve written. These eight principles are not intended to be an exhaustive list of what goes into good writing. But they do cover some of the most important basics. Remember: you don’t need to write a perfect essay. All you need to do is write an essay that will not raise any red flags about your application. If you write a five-paragraph essay that is consistent with the eight principles discussed in this case, you can rest assured that your performance on the writing sample will not derail your law school application.